A gas free standing fryer gives you more options in terms of positioning than built in units, and there are advantages to being able to move the fryer from its usual position for deep cleaning and maintenance, particularly if you opt for a wheeled unit. 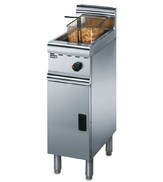 Gas cooking is powerful and quick to achieve and regain temperature when food is immersed. 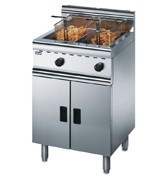 Catering Appliance Superstore stocks an excellent range of gas free standing fryers from leading manufacturers such as Lincat, Falcon, Imperial and many more.